John Farnsworth Quintet to perform the finale of After Work this week. Group leader, Farnsworth's musical style is rooted in the vital, appealing jazz of the 1960s, and with his quintet, they deliver a fresh, vigorous slant on the era for a modern sound. Right click below to download and save the sounds of After Work. 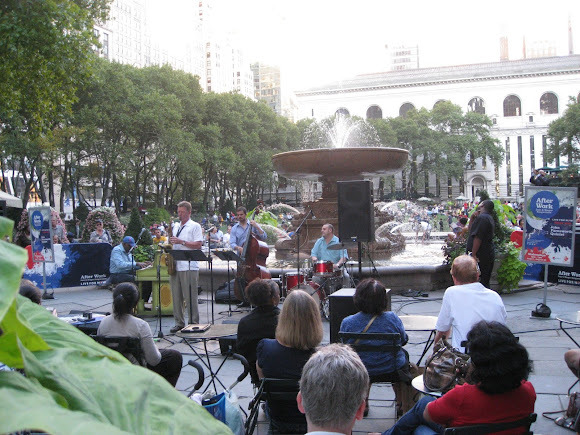 Bryant Park After Work is the perfect outdoor setting for New York area jazz musicians and singer-songwriters. We'll begin booking the 2014 series this winter, so drop us a line if you think you've got what it takes.